The UK is experiencing an epidemic of obesity affecting both adults and children. The Health Survey for England found among boys and girls aged two to 15, the proportion of children who were classified as obese increased from 11.7% in 1995 to 16.0% in 2010, peaking at 18.9% in 2004. There is concern about the rise of childhood obesity and the implications of such obesity persisting into adulthood. The health consequences of childhood obesity include: increased blood lipids, glucose intolerance, type 2 diabetes, hypertension, increases in liver enzymes associated with fatty liver, exacerbation of conditions such as asthma and psychological problems such as social isolation, low self-esteem. The national childhood measurement programme (NCMP) records height and weight in children in both Reception year (aged 4/5) and in Year 6 (aged 10/11). 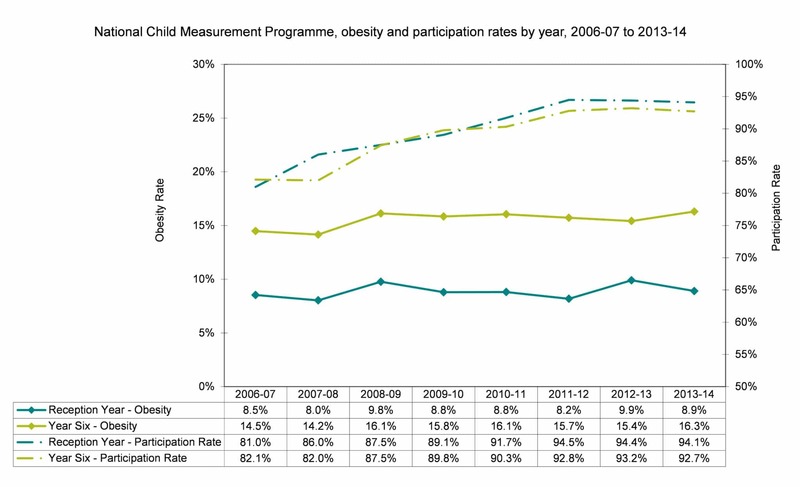 Figure 8.9 below shows the trend in obesity for Devon and also shows the increasing participation in the NCMP programme. 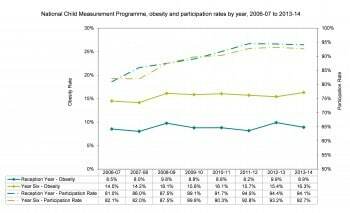 Although there is fluctuation, rates of obesity are relatively stable in both reception and year six.